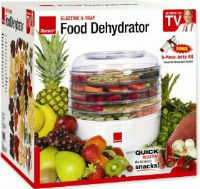 Food dehydrator. Make homemade kale chips and sundried tomatoes. You can make kale chips for some crunchy greens, dry fruit like bananas and peaches for snacks, and make your own sun dried summer tomatoes as sweet accents for fall dishes! There are larger and smaller models and some have timers for automatic shutoff…browse them all to see which is the best one for you. Editorial note: I bought a small circular Nesco model which works great! It doesn’t have a timer though and with a timer/ auto-shutoff, you can dehydrate during the day while you’re at work.